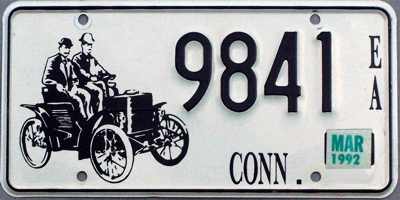 issued to CT antique cars beginning in September, 1952.
run by Antique Auto Enthusiasts for Antique Auto Enthusiasts." Following these is the appropriate section from an illustrated article on the CT DMV website. 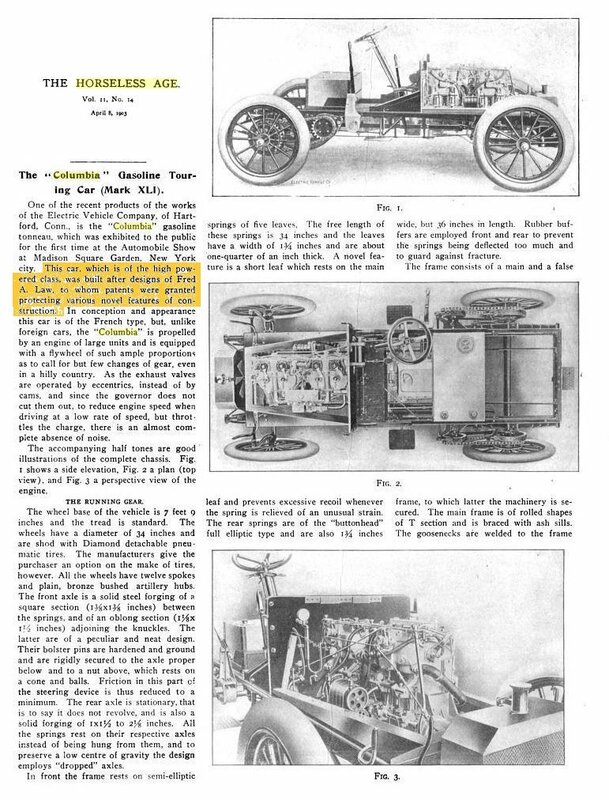 Finally, an article detailing another Columbia model based on designs by Fred A. Law. Welcome to the Connecticut Department of Motor Vehicles history section. 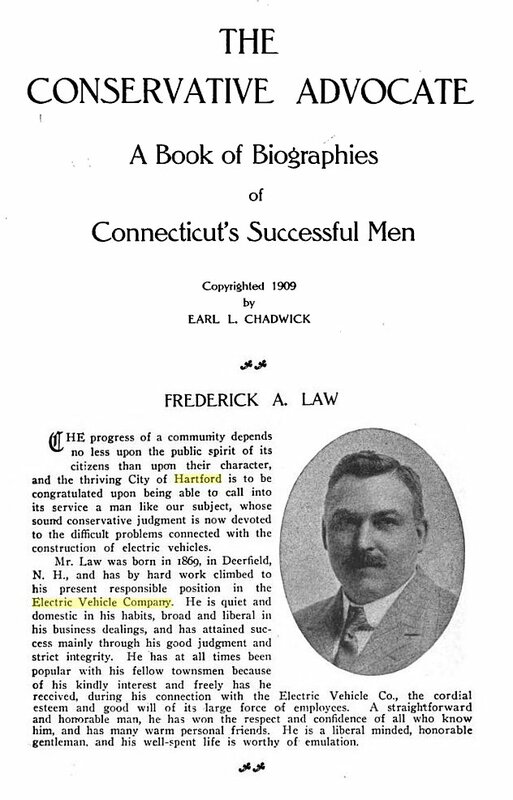 Following is an overview of passenger vehicle licensing since 1903 that we hope you find interesting and informative. The Department of Motor Vehicles in Connecticut has earned a national reputation for undertaking innovative and imaginative approaches to providing the state’s motoring public with the best in products and services. This section is oriented towards passenger vehicles. Additional histories regarding motorcycles, Early American (EA), and the Long Island Sound specialty plate program are being prepared for inclusion in this history section. Other categories are being considered for addition at later dates. This site is organized by blocks of years. This site is sponsored and maintained by the Connecticut Marker History Association. 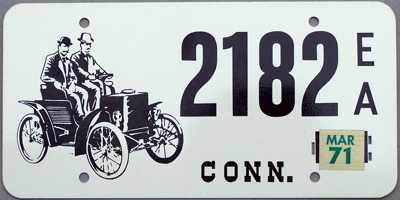 In 1951 Connecticut legislators passed a bill authorizing a marker plate program for antique motorized vehicles at least 25 years old. 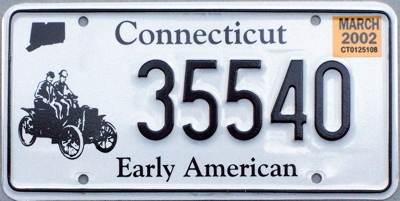 These markers, known as EA or Early American, are a single class for all qualifying vehicles (passenger, combination, commercial, etc) with the exception of motorcycles, which have their own separate series. It has proven to be a very popular program with the antique car community in the state as almost 35,000 vehicles are currently registered. 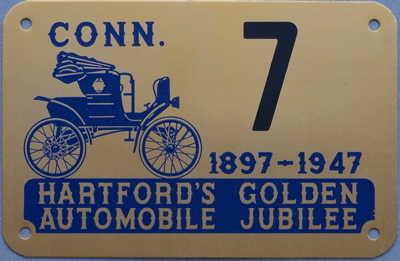 There was a predecessor to the EA program that occurred in September 1947 during the commemoration of Hartford’s Golden Automobile Jubilee. 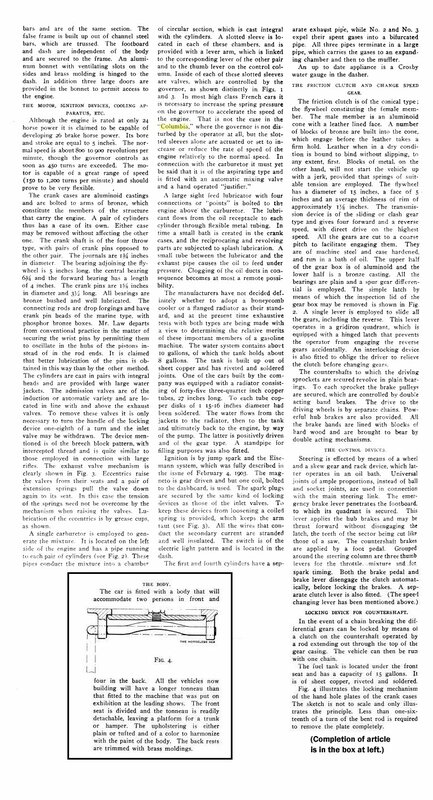 The second revival of the Glidden Tour for antique automobiles took place in New England that year with much of the route on Connecticut’s roads. In conjunction with this event, a major exhibition of the antique vehicles was held at the State Armory in Hartford. 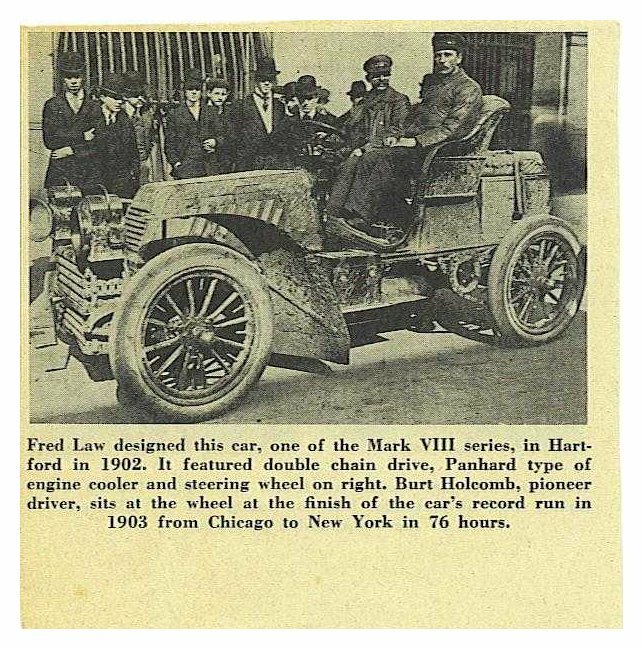 Henry Cave, a former engineer at the Pope Automobile Co. in Hartford, organized the exhibition and also designed special commemorative marker plates for all the participating vehicles. The Scovill Manufacturing Co. of Waterbury produced these markers using a gold anodized flat aluminum base with blue painted lettering and decorative devices with black numbers. The DMV issued these markers with “Temporary Registrations” valid for use only during the month of September 1947. There were 144 pairs produced of which 123 were actually issued. 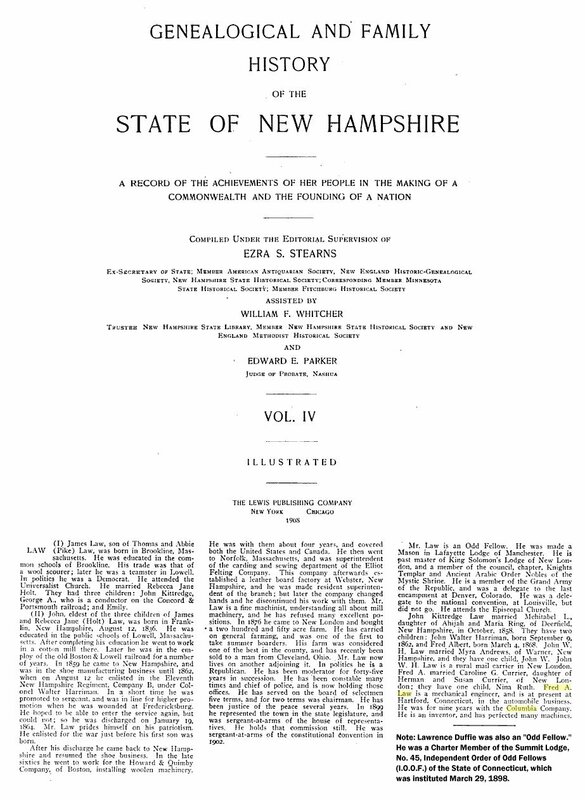 It is believed to be the only such program ever authorized by the State of Connecticut. 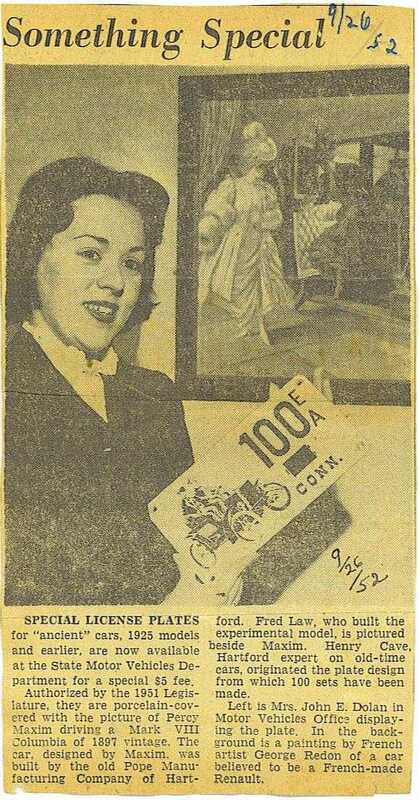 EA Porcelains – The official Early American marker program started in late-September 1952 when the DMV began issuing plates in pairs to owners of qualifying vehicles. These markers were black on white porcelain with a steel base and were once again designed by Henry Cave. The Cooper Oven Thermometer Co. in Bristol produced them for the DMV. The markers were 6” by 11” in size with mounting holes fitted with aluminum grommets in each corner to protect the porcelain coating. Depicted on the left side of the marker was an 1897 Columbia automobile that was produced by the Pope Automobile Co. It was one of the earliest self-propelled vehicles to utilize a steering wheel instead of a tiller. 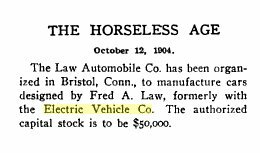 The driver is Hiram Maxim who was the Chief Engineer of the Pope Co. at the time and his passenger is believed to be Albert Pope, the company president. There were 1500 pairs of these markers produced for the state beginning at number 100 and running consecutively through 1599. The number 100 pair was retained by the DMV so the general issue started at number 101. These EA markers and all of the type since then expire at the end of March in any given year. The highest numbers in this porcelain series were issued late in 1961 with March 1963 expirations. 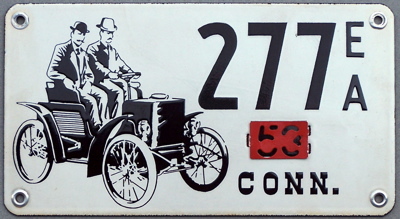 EA Flat Markers – The DMV replaced the porcelain plates with a new series of flat aluminum 6” by 12” markers starting with number 1600 and ending at 7999 that lasted into 1988. They continued the color scheme of black letters, numbers and vehicle depictions on a white background. All of the black painted devices were applied with a stencil system with the vehicle now reduced in size from the porcelain style. The type face, size and placement of the letters and numbers was changed several times during the life of this series and it seems as though each batch produced was distinctively different from the previous ones. 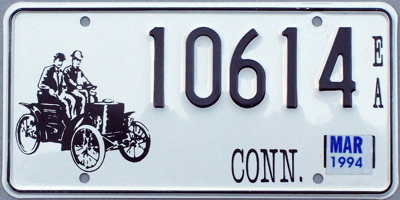 EA Embossed Markers – Starting in 1988 the DMV replaced the flat markers with a new black on white style featuring embossed borders and numbers. The abbreviated name of the state, EA designation and vehicle depiction continued to be screen painted onto the marker surface. This series started with number 8000 and continued to 33,999 though some of the highest numbers were not issued when the series ended in late 1999. To accommodate the use of five digit numbers over 10,000 the illustration of the vehicle was reduced in size. Vanity markers with up to five letters/numbers became available with this series and all numbers below 101 were also issued. EA Reflective Markers – In conjunction with the general marker replacement program that began in 2000 the DMV started a new series of embossed black on off-white aluminum reflective EA plates. The use of the logo EA was discontinued and replaced with “Early American” on the bottom of the marker. Connecticut, now spelled out completely for the first time since the EA program began in 1952, was centered on the top of the marker. Also pre-printed on the plastic reflective sheeting was the state map on the upper left and picture of the antique car. Once again, as in each EA redesign since the inception of the program in 1952, the vehicle was reduced in size. This series started with the number 34,000 for new registrations.